Kagero is a publisher based in Lublin, Poland. 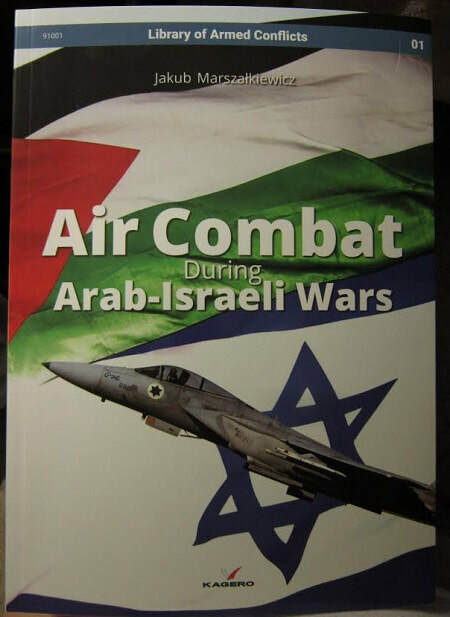 ​This book shows the major role of aviation in the armed conflicts of the 20th Century using example of the Arab-Israeli wars. It presents the primacy of the effectiveness of modern Israeli aviation, which is generally equipped with state of the art equipment and well-trained personnel, on Arab aviation which was based primarily on numbers rather than quality. In these activities, Israel has shown the perfect example of "Blitzkrieg" strategy, which within a few hours enabled it to annihilate the more numerous Arab forces with its modern and well-trained aviation. It also describes the history of the rise of Israeli aviation, including its many Polish-related topics. The author is an aircraft pilot and graduate of the LZN Aviation College in Wroclaw. He holds a Master's degree in Air Traffic Management obtained at the Department of Aviation of the National Defense University (AON) in Warsaw and postgraduate studies in this field at the Polish Air Force Academy (WSOSP) in Deblin. In 2012, he received a Doctorate in Defense Science at AON. His dissartation concerned the use of aviation in armed conflits. He has also completed the Instrument Flight Rules training in Poznan and has piloted multi-engined airplanes at the Canadian Flight Academy in Toronto as well as theoretical courses on the Airline Transport Pilot License ATPL (A) and Flight Dispatcher. He has also flown gliders. Currently, he works as a lecturer on aviation, logistics, transport and national security at the Banking College in Gdansk, Gdansk University of Technology, and sometimes also at other universities. He is also a member of the Lower Silesian Aviation Academy, operationg at the Open Museum of Technology Nadbor in Wroclaw. For many years he has published articles for aviation magazines. He has produced dozens of articles for the Polish aviation press and several Great Britain and Canadian publishers as well, and several aeronautical and academic manuals for AON and WSOSP. This book is soft-cover of 104 pages in 7 1/2" x 10" page format. There are 93 pages of text in English. The book contains 91 black and white photos and 76 color ones. There are 13 maps included, one color painting and a data list. Also shown are 3 color illustrations of Israeli squadron badges. B-25J Mitchell (2 volumes), P-51/F-6 Mustangs (2 volumes), Curtiss P-40 Warhawk, Grumman F6F Hellcat, B-17 Fortress in Combat Over Europe, and P-47 Thunderbolt With the USAAF. Panzer II & Luchs, Mi-28 Helicopter, British Infantry Tanks, Vol. 1 & 2 of Panzer IV, Ka-50 & Ka-52 Helicopters, Char Le Clerc and Brummbar. The cover art shows a Israeli Mirage posed over a Israeli flag that is below a unknown flag. This book will be of great interest to aircraft modelers and aviation historians alike.